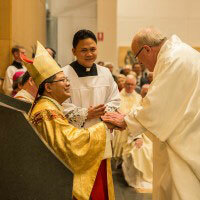 Bishop Vincent Long Van Nguyen OFM ConV and Archbishop Anthony Fisher OP. The clergy and Catholic people of Parramatta have been waiting for long and here I am, only five feet and a half though. 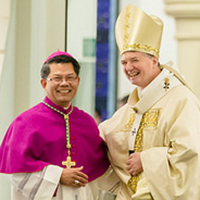 After 19 months without a bishop, you have been given one in the person of a Vietnamese Australian and a former boat person. Perhaps, you can add my appointment to the list of surprises that Pope Francis has done. This entry was posted in Bishops, Homilies, Special interest and tagged Bishop Vincent Long, Diocese of Parramatta, Homily on June 22, 2016 by ACBC Communications. This entry was posted in Bishops and tagged Bishop Vincent Long, Mass of Installation on June 22, 2016 by ACBC Communications.